50 MPH Tomatoes-Good Year Round! Put the cornmeal, salt & pepper in a shallow bowl. 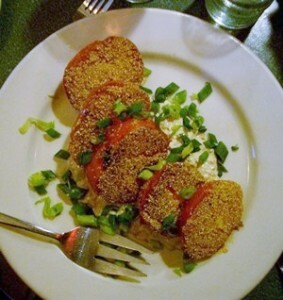 Coat tomatoes with the cornmeal mix, pressing slightly to make sure they adhere. In a heavy 12” frying pan (cast iron is ideal) over medium heat, heat ¼” oil until hot – don’t let it smoke. Fry the tomatoes for 5 minutes until golden brown, carefully flip and fry another 5 minutes. Drain on paper towels. Smear the dressing on a plate. Plate tomatoes side by side on the dressing so they stay crisp. Sprinkle with scallions, serve and enjoy! My verdict: Delicious! Not as good as being at Miranda (this photo is from there), but not bad for a first attempt. 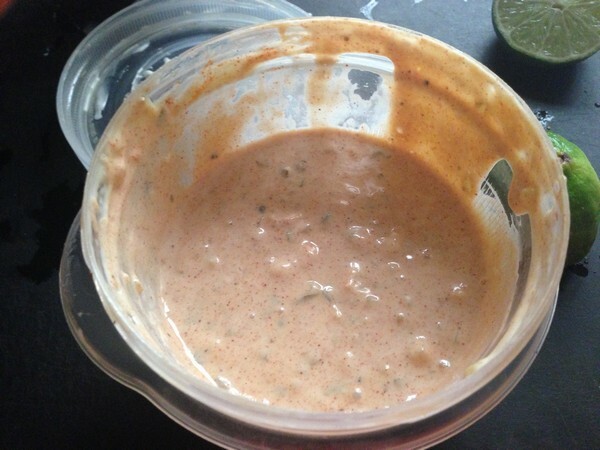 The sauce is a great version of Russian dressing with a little heat! I didn’t have any hot pepper relish, so I used slightly less than 3 tablespoons of India relish (and a little squirt of Sriracha in Kerry’s honor), the juice of half a lime and fresh dill in place of dried. 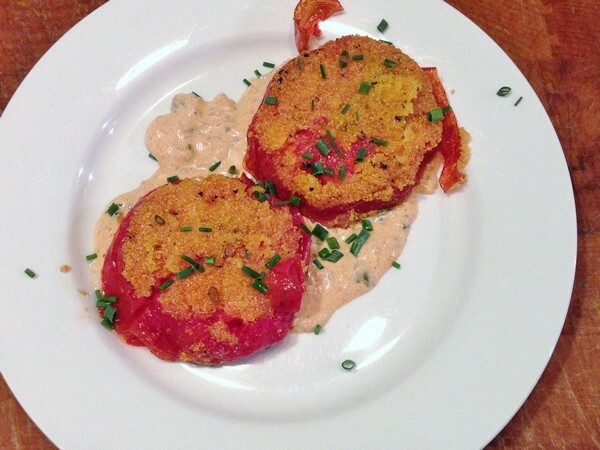 Kerry says this is a good way to use less than perfect tomatoes, so remember it for when you’re a bit discouraged by the tomatoes in the market. When I made it, it was tomato season, and we used a couple of big, beautiful beefsteaks, so they just needed about 3-4 minutes a side. 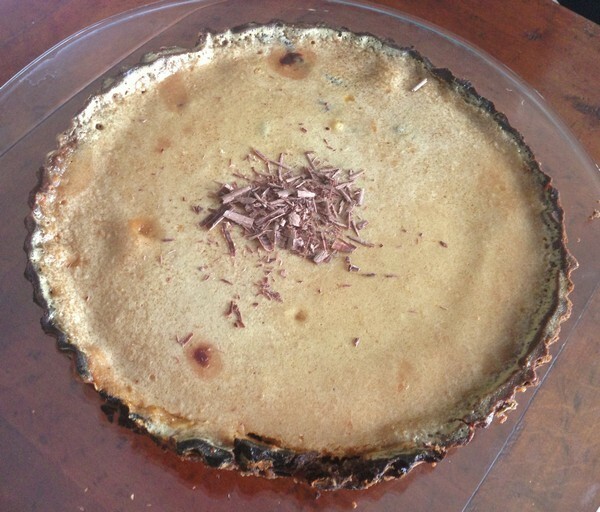 The cornmeal crust was nice and crunchy, we just needed more of it, so next time I’m just going to eyeball a dish full so they get a better crust. Chives made a good garnish as there were no scallions. 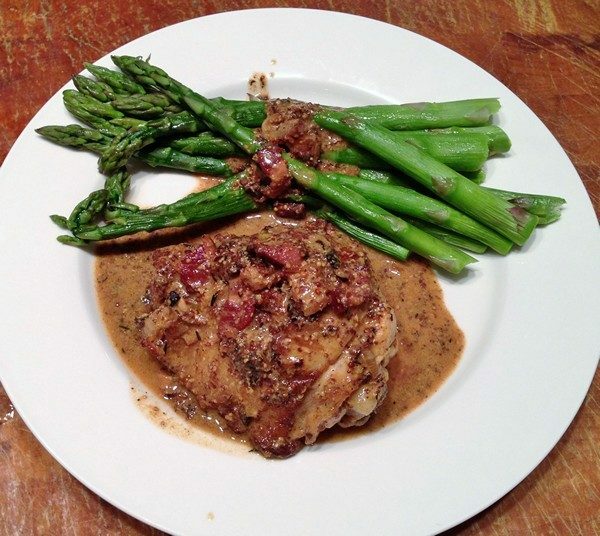 When the Accidental Locavore first saw this recipe in My Paris Kitchen, I knew I had to try it. There were a bunch of oil-cured olives in the fridge, so it was just a matter of finding some whole wheat flour and buttermilk. The buttermilk appeared in the latest butter-making process, and the whole wheat flour is local. This is adapted from My Paris Kitchen, and as David says, requires the use of a good bread knife. Preheat the oven to 350°. 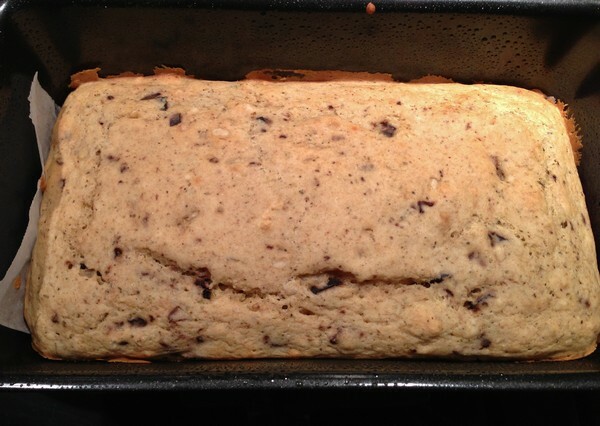 Spray a 9” loaf pan with non-stick spray, or oil it lightly. Line the bottom with a piece of parchment paper. 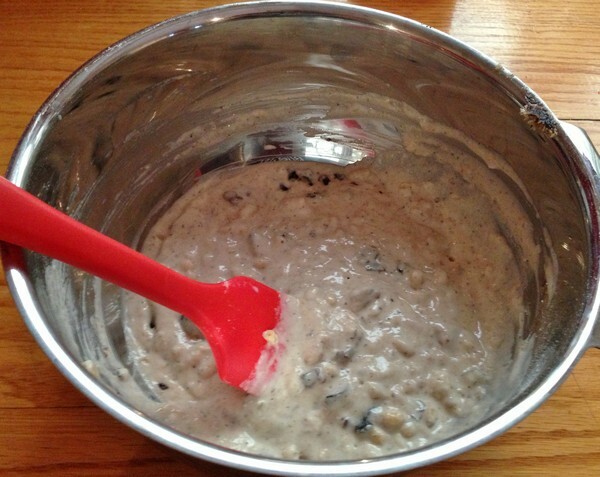 In a bowl, whisk together the flours, sugar, herbes de Provence, salt, baking soda, and pepper. Stir in the buttermilk, mix in the olives and nuts. Pour into the baking pan. Bake for 30 minutes, until it feels set in the center. Remove from oven and let cool for 5 minutes. Run a knife around the edges to loosen it, remove from the pan and set on a wire rack to cool. Decrease the oven temperature to 325°. Line two baking sheets with parchment paper. Holding the outside edges of the loaf firmly, to keep the edges from crumbling, slice the loaf as thinly as possible, aiming for ¼” thick slices. Lay the slices on the baking sheets. Bake for 30-35 minutes, flipping the slices after 15 minutes. Keep an eye on them during the last few minutes of cooking, you want them to be a deep golden brown, so they’ll crisp up when cooled. Remove from oven and cool completely on wire racks. The crisps can be stored for up to 1 week in an airtight container. Serve (with some great cheese) and enjoy! My verdict: The first thing I baked in my new oven, these come together really easily and tasted great! The only difficult thing is cutting them perfectly. 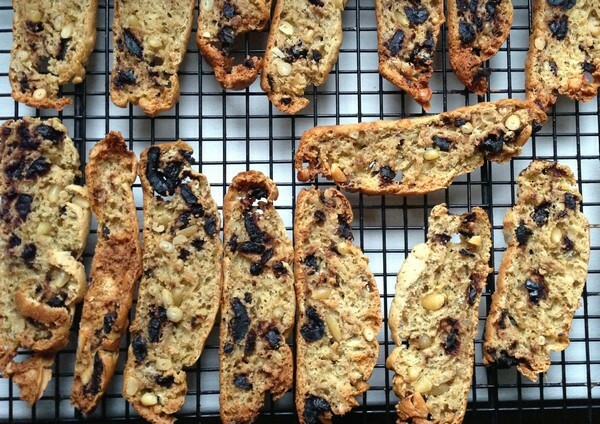 I used pine nuts instead of almonds (which were in the original recipe) and it was tough cutting through them. It’s nice to have the crunch of the nuts, but it would be a lot easier cutting cleanly, without them. My only other complaint (and its minor) was that I tossed the leftover crisps in a Ziploc bag and they lost their crispness. Now, there are two solutions: finish them or toss the leftovers in the toaster-you choose. 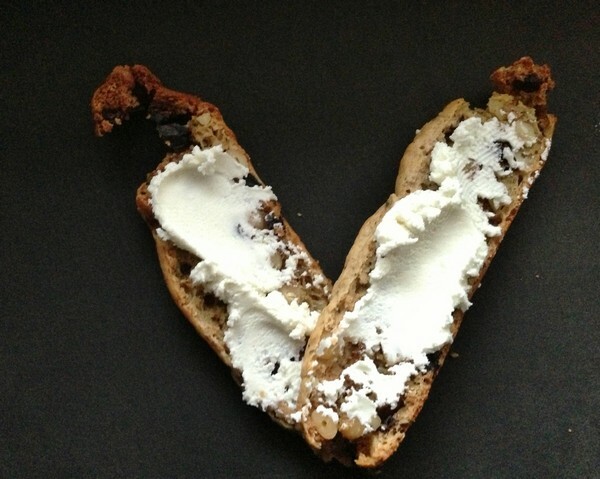 We ate them with a nice chèvre, which was a pretty perfect combination. Try them the next time you’re serving a cheese plate, they make a nice change from the usual baguette or crackers. 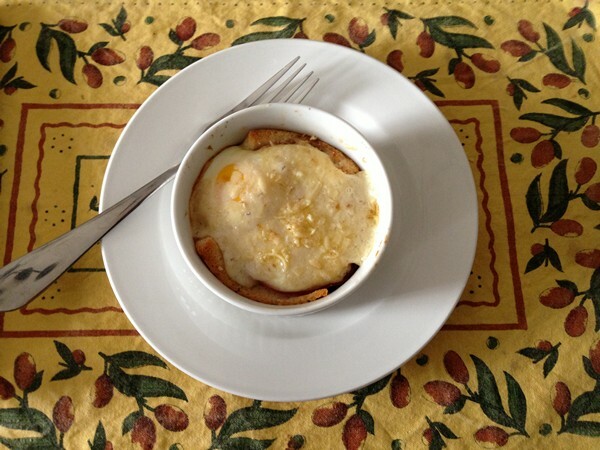 Croque Madame Muffins: A Great Brunch Recipe! Although the Accidental Locavore never has white bread in the house, for this croque madame recipe from Rachel Khoo’s great book The Little Paris Kitchen, I snuck out and bought a loaf. As with anything this simple, the better your ingredients, the better tasting the results. This is her version of a croque madame, which is traditionally a croque monsieur with a fried egg on top. The sauce will serve 6, it’s up to you to make as many “muffins” as you’d like. It should take you less than an hour from start to finish. To make the sauce, melt the butter in a small pan over medium heat. Add the flour and whisk hard until you have a smooth paste. Remove from the heat and allow to cool for 2 minutes. 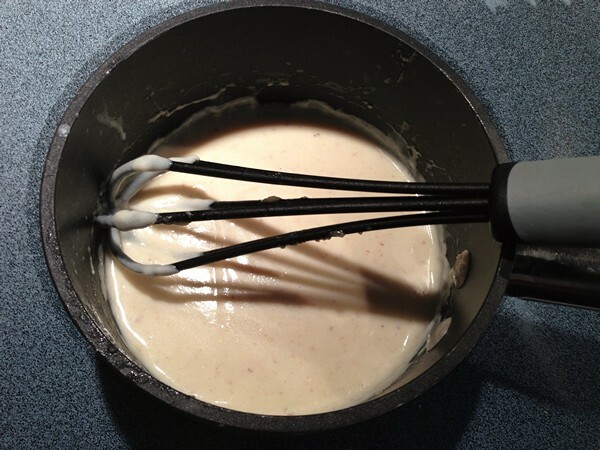 Gradually add the warm milk, whisking constantly. Put the pan back on the heat, add the mustard and nutmeg and simmer gently for 10 minutes, whisking frequently. 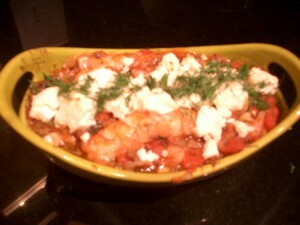 The sauce should thicken and be the consistency of thick tomato sauce. Remove from the heat, stir in the cheese and add the salt and pepper. Taste for seasonings and set aside. To make the muffins, preheat the oven to 350°. Flatten the bread with a rolling pin (or a wine bottle) to about ¼”. Brush both sides with the melted butter and place in a muffin pan. Press into place. Then, add an equal amount of ham to each and top with an egg. Add 2 tablespoons of sauce to each and sprinkle with the rest of the Gruyère. Bake for 15-20 minutes depending on how runny you like your eggs. Serve and enjoy! My verdict: I’ve made these croque madame muffins for brunch, they’re pretty, easy and taste great! Since I currently don’t own a muffin pan, I’ve been cooking them in ceramic ramekins on a cookie sheet. The advantage is that you can have more stuff in each one and use bigger eggs, the disadvantage is the cooking time ends up being close to 30 minutes. We tried using brioche tins, but they were a mess and impossible to clean. The last time I made them, I had great Serrano ham, fresh eggs from my friend Bill and aged Gruyère from Murray’s…pretty spectacular! If you wanted to do them for a bigger meal, a simple salad would go nicely. Update: Bought a muffin pan and it made a huge difference! Only one thing to think about, you’ll need smallish eggs when you use the muffin tin. Also, having the bechamel sauce made ahead of time makes this done in a half an hour. Added bonus, run the crusts of the bread through the food processor to make fresh bread crumbs! The Accidental Locavore can’t think of a cozier place to be on a snowy January day, then in the kitchen. Rather than shovel snow, or worse, get stuck watching football, the Locavore thought it was time for corn soup. This recipe, adapted from Bobby Flay’s Bar Americain cookbook, has intrigued me since this summer, and because of it, there were a dozen corn cobs and a large bag of frozen kernels in my freezer. It would serve about 4 big bowls and took about 1 1/2 hours, mostly unattended. Using a sharp knife, cut the kernels from the corn. Cut the cobs in half and put in a large stock pot. Put the kernels on a baking sheet. Add to the stockpot: the bay leaf, onion and 2 quarts water. 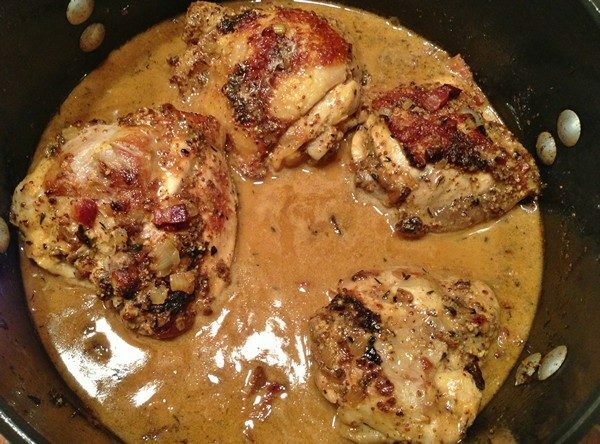 Bring to a boil over medium-high heat, reduce the heat to low and simmer for 30 minutes. Remove the cobs and cook until it’s reduced to about 5 cups of liquid. Toss the corn kernels, garlic and bacon on the baking sheet with 2 tablespoons of olive oil, salt and pepper. Roast in the oven, stirring once or twice until slightly golden, about 20 minutes. Remove from the oven and set aside. Remove the garlic from the corn and bacon mix. Heat the olive oil and butter in a medium saucepan over medium-high heat. Add the garlic and cook while stirring, for 1 minute. Add the wine, bring to a boil, and cook for about 5 minutes, until the alcohol is evaporated. Add the corn kernels and bacon and cook for 5 minutes, stirring occasionally. Add the stock, bring to a boil, reduce the heat to medium and cook for another 30 minutes. If you like your soup really smooth, purée it in a blender (and if you like it really smooth, strain it after blending it). If, like the Locavore, you prefer it a little chunky, remove about 1/4 cup of the kernels and some of the bacon and set aside. 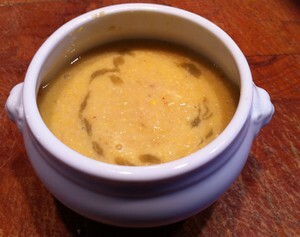 Purée the remaining soup in a blender, food processor, or use a stick blender until you reach the desired texture. Stir in the creme fraiche or sour cream, the kernels and bacon you set aside. Taste and add salt, pepper and sugar as needed. Serve and enjoy! My verdict: this was really good, maybe not as good as the corn and potato chowder I usually make, but a good variation. Bobby Flay’s original recipe has you add sugar in before blending and that made it too sweet. The Locavore likes using the cobs to make stock and next summer, will just collect them and toss them in the freezer for future soups. Since I was using frozen cobs and kernels, everything took longer, but the end result was delicious! I also tossed in a little jalapeño Tabasco sauce to give it a little kick. Frank’s verdict: really good. 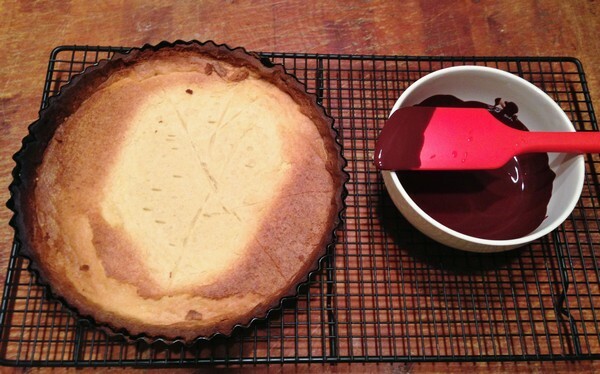 He would have liked a little more texture, which was easily remedied by adding in some more kernels. So far, the Accidental Locavore has stuck to my once-a-week seafood goal. A piece of cod found in the freezer clean-out inspired this recipe, based on one of my favorites: Rick Bayliss’ Mexican Everyday. Below is his recipe, for 4 people. It’s easy and fast. I use half the potatoes and fish to serve 2 and keep the rest of the salsa for other uses. Heat the oven to 400 degrees. Put the potatoes in a microwave and oven-safe dish big enough to hold the potatoes in a single layer. Drizzle on the oil, sprinkle with salt, toss to combine and place the potatoes in a single layer. Cover and microwave until the potatoes are barely tender, about 4-5 minutes. Meanwhile, in the food processor combine the tomatoes with their juice, garlic, cilantro and jalapeños and their juice. Process until puréed with a little texture. Layer the fish in a single layer over the potatoes. Top with the salsa. Bake for 15-20 minutes, until the fish flakes and is just opaque in the thickest part. Serve and enjoy! My verdict: this time I used my own tomatillo salsa (click here for the recipe) and the cod from the freezer. It was good but not great. The cod would have stood up to the regular tomatoes and jalapeños. 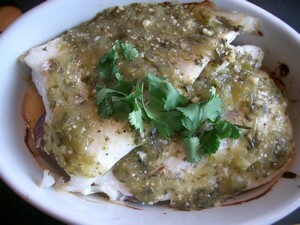 With the tomatillo salsa I would have liked a sweeter white fish. Adding a good squirt of lime helped. If you do want to use your own, or a jarred salsa, just leave out the last four ingredients (keep the jalapeños if you like the heat). 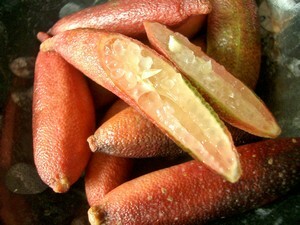 Suddenly, the Accidental Locavore has been hearing a lot about finger limes. For something that wasn’t even on my radar, all of a sudden, they’re everywhere. When Fresh Direct had them as a President’s Pick recently, I decided to take them for a test drive. If you live in a more citrus-friendly place (almost anywhere south of here), you’re probably thinking, finger limes, no big deal. Fine. For the rest of us, they’re kind of cool. 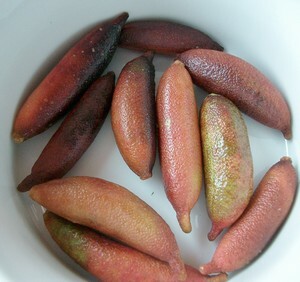 Small and in various shades of red/burgundy/brown/green, finger limes have very distinct flesh, resembling grains of caviar (except prettier, being the palest pink). And treating the pulp like caviar is a great way to serve it. The Locavore decided to use them as a garnish for seared sea scallops on sliced Yukon Gold Potatoes in a beurre blanc sauce. This, with some sautéed spinach, fed 2. Timing is a little tight, but you could do what I did and just keep all the components in a warm oven until you’re ready to assemble. Boil the potatoes in a medium pan of water with salt added, over medium-high heat until just tender, about 10 minutes. Drain, pat dry and set aside. Boil the vinegar, water and shallots in a medium sauce pan over medium-high heat until mixture is reduced by half, about 10 minutes. Add cream, reduce heat to low. Whisk in one piece of butter at a time, until they’re all melted and combined. Strain sauce, pressing on shallots, to get as much liquid out of them. Return to pan and place in a warm (as low as it goes) oven to keep warm. Pat dry the scallops. 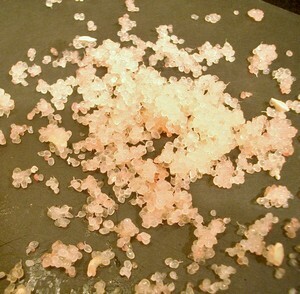 Sprinkle with salt and pepper, and dredge in the flour, shaking off excess. Add the scallops to the pan that the potatoes were in and cook until golden brown and just opaque in the center about 1 ½ minutes a side. Pour the beurre blanc sauce on two plates. Place the potatoes on the sauce and top each with a scallop. Garnish with the finer lime “caviar”, serve and enjoy! My verdict: The finger limes added a nice citrus crunch to the scallops. It was like the crunch you get from an inside-out sushi roll. I’m not a caviar fan, so this was a great way of getting that nice tiny crunch without the fishy taste (and not so budget-busting). 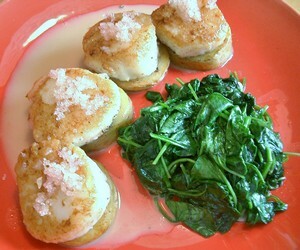 The scallops were perfectly cooked and went well with the beurre blanc sauce. I thought about adding a little lime zest to the beurre blanc, but got lazy. Not sure the potatoes were essential and if I did it again, might use a more starchier potato. This was a very fancy looking dinner, (that tasted as good as it looked) without being too fussy or time-consuming. Frank’s verdict: “Excellent!” He would have poured some of the sauce over the top of the scallops and spread out the lime a little more (he didn’t know how sticky it was!). Otherwise he was a happy eater! This recipe for blueberry caramel sauce is adapted from Gordon Hamersley’s Bistro Cooking at Home. It’s easy and quick and makes a lot (2 1/2 cups). He suggests serving it with a peach galette, but I went straight for vanilla ice cream. My friend took some home, and we were wondering how it would be over waffles or pancakes. What do you think? In a medium saucepan over medium-high heat, cook the sugar to a light amber color. Cook it slowly and stir it to keep it from cooking too fast and getting a burnt taste. The sugar might harden, just keep cooking and stirring it until it smooths out. Add the blueberries and water to the cooked sugar. Be careful! The caramel will bubble and steam, so don’t stand right over the pot. 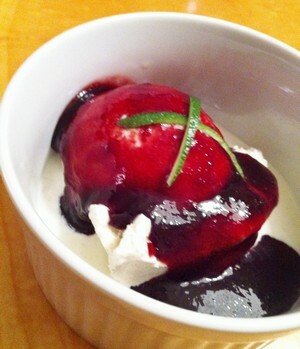 The sauce will harden up because you’re adding cold berries, but will remelt as it heats up. Cover the pan and reduce to low. Simmer until most of the blueberries have popped, about 5 minutes. Remove the lid and stir to dissolve any lumps of caramel. Remove from the heat and strain the sauce to remove the blueberry skins and any hardened bits of caramel. Return to a saucepan, add the lime juice, and butter if you’re using it. You may also want to add a little salt to balance the flavor. Cook over medium-high heat until the sauce has reduced and isn’t too runny. Serve at room temperature or slightly warm. Enjoy! If your pan has hardened sugar on it the best way to clean it is to fill it with enough water to cover the hardened sugar. Heat it, stirring occasionally until the sugar is melted, then it will clean up easily.